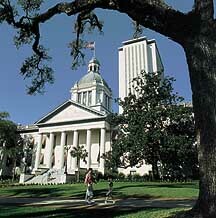 Florida's capital city, the name coming from the Apalachee Indian words for "old town", Tallahassee became the capital in 1823 when William Pope DuVal, the first civilian governor, desired a central location for the legislature to meet. It was, in 1539 the site of the first Christmas celebration in US history when conquistador Hernando de Soto set up winter camp there. Often described as "The Other Florida" with its deep-rooted history, rolling hills and southern-style hospitality, Tallahassee is a Florida to explore. There are many fascinating attractions to be enjoyed. Historically speaking, there's the Mission San Luis, the site of an Indian village and Spanish mission settled from 1656-1704. The Museum of Florida History has lots of old exhibits, some prehistoric. The Old Capitol, completed in 1845, is full of Florida's political history, while the Pebble Hill and Goodwood Plantations take you back to a more recent, yet gracious time. Nature lovers will enjoy the Meseum of History and Natural Science, set on 52 acres and featuring wolves, panthers and alligators. Wakulla Springs State Park has one of the world's deepest freshwater springs, and offers glass-bottom boat rides with excellent opportunities for wildlife encounters. Florida Caverns State Park has intriguing calcite formations, while the Gulf Specimen Marine Lab offers hands-on encounters with marine life of all kinds. Apalachicola National Forest has more than 500,000 pristine acres of woodland,rivers and springs to explore, and the Falling Waters State Recreational Area offers fun activities and a spectacular waterfall. There are many golf courses to choose from, and tennis courts are plentiful. Horse riding on beautiful trails is available, as are all the attractions of nearby Gulf beaches such as Alligator Point, Dekle Beach, Dog Island and more. Lakes offer ample boating and fishing and swimming opportunities. Twelve miles to the north is Havana, a charming historic town with terrific shopping and dining.